After months of speculations whether Apple will release completely new Apple TV device making it a high-end media center for our living rooms or rather leave it, more or less, as it is (means without all the latest true HD capibilities, IP streaming, Blu-ray, live TV ability, HD recorder, 1080p support, etc. )… we still don’t know the answer. 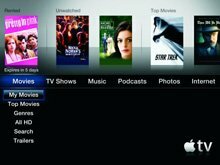 The company introduced new Apple TV 3.0 software that gives us not more than a redesigned main menu – which is said to give a faster access to the content, possibility to watch iTunes Extras and enjoy iTunes LP in fullscreen and listen to the internet radio (including stations in high-quality HE-ACC formats). Epix plans to offer full-length HD movies over the Internet using a dynamic-streaming feature from Akamai Technologies’ content-distribution network. The movie service, created by Viacom, MGM and Lionsgate, previously said it was launching as a broadband-video service in May, followed by the linear cable channel in October.